HomeResourcesWhat is a Rain Garden? Also known as a bioswale. A rain garden is a feature that replaces an area of your lawn to collect stormwater (rain and melted snow) that runs off the roof, yards, and hard surfaces such as driveways. The depression is shallow and has loose, deep soil that absorbs and filters runoff preventing it from entering storm drains and waterways. 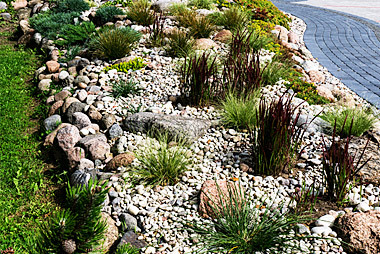 Rain gardens can complement any landscape style and can be adapted to personal preferences. They can be large or small depending on your needs. By planting a rain garden, you help maintain the natural water cycle, protecting local rivers, creeks, lakes, fish and drinking water sources. Limits the amount of water entering the storm drain system. Reduces the potential for flooding, drainage problems and bank erosion. Restore and recharge our groundwater. Low maintenance. Usually filled with hardy plants that require minimal watering. Allows approximately 30% more water to soak into the ground than a standard lawn. The water that runs off the land during a storm or snowmelt instead of soaking in. Stormwater and snowmelt pick up and carry material into the storm drain system from lawns, streets and parking lots. Storm drains lead to the nearest body of water. Large objects get screened out, but the water is not filtered and gets carried to nearby lakes and rivers causing stormwater pollution. The pollutants or contaminants can be fertilizers, pesticides, bacteria from pet waste, road salt, soil, and more. 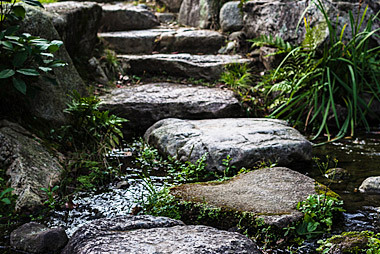 Do you have a low-lying area where water flows naturally during heavy rainfall? Would you like to install a new garden or have one you would want to redesign? Is the garden space at least 3 meters away from any foundation? Is the space relatively flat? Is there a source of water to feed the garden space such as a downspout or rain barrel? Place close to the source of water, such as a downspout, infiltration trench or overflow from a rain barrel. Do NOT place closer than 3 meters from the foundation of any building. Place at least 4 metres from any septic bed. If uphill from a septic bed, it should be at least 15 metres away. Do NOT install within 15 metres of any steep slopes on or around your property to prevent landslides from excess water absorption. Locate and mark all underground service lines before digging. Areas with poor drainage are not good locations unless the soil has been amended to make it suitable. These are a few suggestions. Consider viewing rain gardens in your area or online for ideas. Plants used in a rain garden need to tolerate both wet and dry conditions due to alternate flooding following storms and drought during periods of low rainfall. Native plants are good choices as they are well suited to local growing conditions as well as supporting wildlife. Choose a variety of plants, shrubs and grasses to create changes in colour, height and texture. Consider your existing landscape and what will work best with it. If you are planning to build your garden near a road, think about sight lines and setbacks.